Following National Assembly Elections held on the 28th February 2015, the Right Honourable Dr. Pakalitha Bethuel Mosisili was on Tuesday 17th March, inaugurated as Lesotho’s new Prime Minister in an auspicious ceremony that was held in the Lesotho capital, Maseru. This followed a Coaltion agreement between his Political Party the Democratic Congress with six other parties to form a Government after no party had won an out-right majority in ninth Parliament of the Kingdom of Lesotho. Dr. Mosisili was sworn in by the Chief Justice of Lesotho in the presence of King Letsie III and dignitaries from SADC member states, in particular the President of South Africa, His Excellency Mr. Jacob Zuma. The Out-going Prime Minister Dr. Motsoahae Thomas Thabane officially handed over the reigns of Government Power to his successor in this occassion. In his inaugural speech, the Prime Minister alluted to the need for the Government to unite the people of Lesotho in a common goal of peace, stability, and development, and to prioritise national interest ahead of individual or party-political interests. The Prime Minister is expected to announce the Cabinet of Ministers of His Majesty's Government in due course. Following National Assembly Elections held on the 28th February 2015, a new Coalition Government is expected to be inaugurated in Maseru on Tuesday 17th March. Lesotho had to go for an early election under the Southern African Development Community (SADC) mediation led by the facilitator His Excellency Mr. Cyril Ramaphosa, Deputy President of South Africa. Parties that won two seats each were the Popular Front for Democracy (PFD) and the Reformed Congress of Lesotho (RCL). Four parties that won one seat each were the Marematlou Freedom Party (MFP), National Independent Party (NIP), Basutoland Congress Party (BCP) and the Lesotho People’s Congress (LPC). Ten political parties are therefore represented in the ninth Parliament of the Kingdom of Lesotho. In a press briefing on March 5th, leaders of the DC, LCD, MFP, NIP, BCP and LPC – later joined by the PFD – announced an intention to form a coalition government. When the ninth Parliament convened on the 10th March, a Member of Parliament (MP) for the DC, Hon. Ms. Ntlhoi Motsamai MP was elected Speaker of the National Assembly and Mr. Montšuoe Lethoba of the LCD was elected Deputy Speaker. This is considered as confirmation that the DC-led coalition enjoys the support of the Majority of Members of the National Assembly, a condition considered necessary and sufficient for its leader to be considered Prime Minister Designate. It is therefore expected that Honourable Dr Pakalitha Bethuel Mosisili MP, who had been Prime Minister from 1998 to 2012 will be inaugurated as the new Head of Government of Lesotho on Tuesday 17 March 2015. 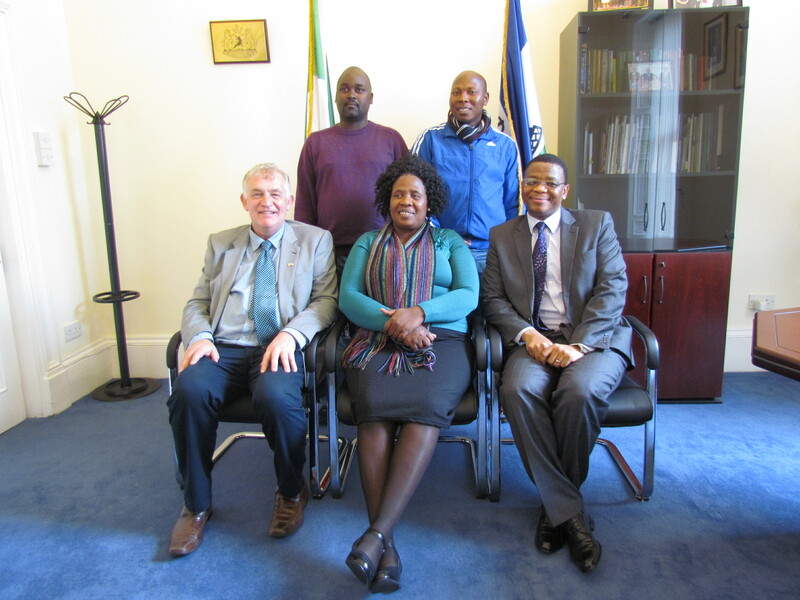 A team of three teachers from Hlalele High School in the Maseru District is currently in Ireland as part of the School’s exchange programme with Portmarnock Community School under the auspices of Action Ireland Trust. Their visit follows a recent visit to Lesotho by the Trust earlier this month. Today the team, which is led by the school Principal Mrs. Malerato Molise, paid a courtesy call on the Ambassador of Lesotho to Ireland H.E. Mr. Paramente Phamotse. The team will head back to the Mountain Kingdom on the 05 March 2015. The Kingdom of Lesotho will be going for National Assembly Elections on the 28th February 2015. This follows the dissolution of the 8th Parliament in December 2014 and the subsequent announcement of the Election Date by His Majesty the King. Twenty one (21) political parties and some independent candidates will compete for 120 National Assemby seats. According to the National Assembly Electoral Act of 2011, only stipulated persons may apply to be Advance Electors and their applications should reach the Independent Electoral Commission (IEC) in Maseru by the 11th January 2015. Those who will be permitted as Advance Electors, mainly public officials who will be on official duty on the election date, will be allowed to cast their advance votes on the 21st February 2015. 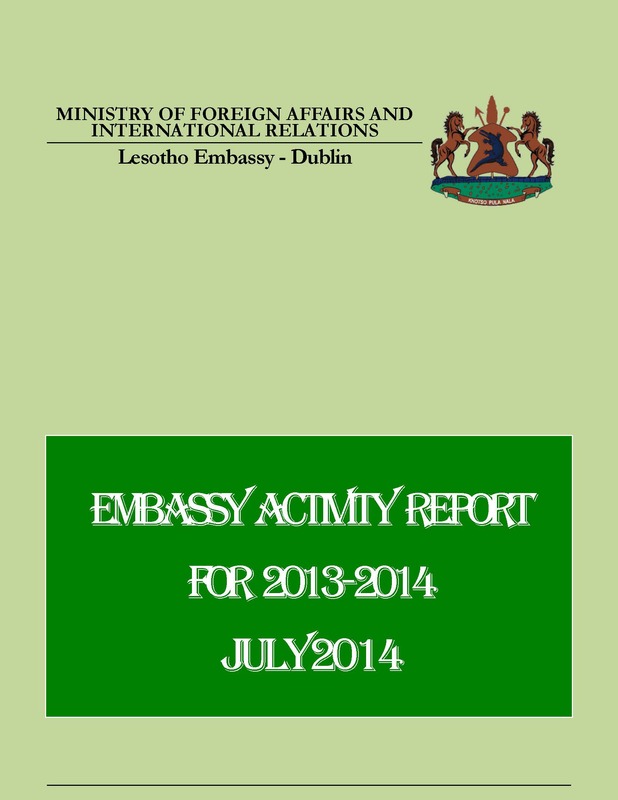 Those persons who will have been approved as Advance Electors by the IEC after the 11th January, and who will have stated the Lesotho Embassy in Dublin as their preferred voting station will be notified to present themselves for voting on the 21st February 2015, in line with the Electoral Act. For more information on the Lesotho National Assemby Elections 2015, visit the Lesotho IEC Website by clicking here. The Lesotho Embassy in Dublin will be closed from 12.00 on the 24th December, 25th December and 26th December 2014. It will also be closed on the 1st January 2015. 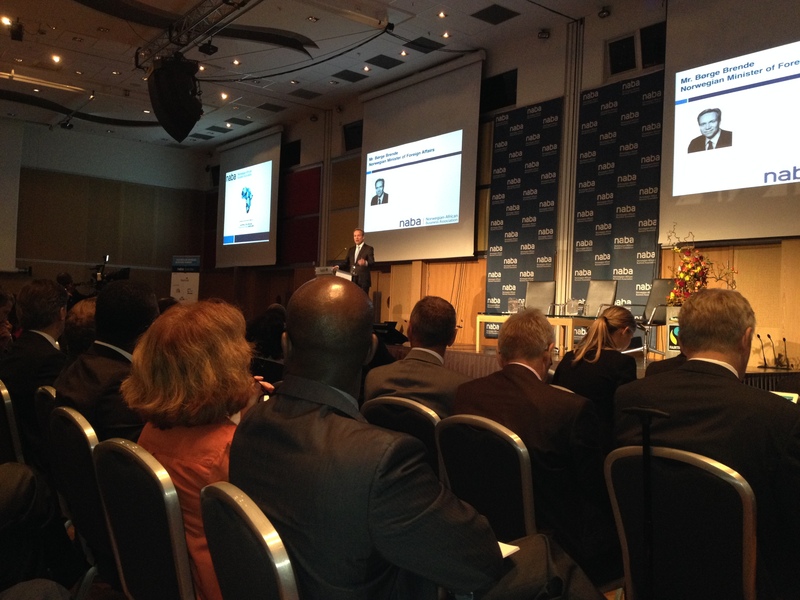 Embassy participates in the Africa-Ireland Economic Forum and the Norwegian African Business Summit. The Embassy of the Kingdom of Lesotho in Dublin once again took part in the Africa-Ireland Economic Forum (AIEF) and the Norwegian African Business Summit (NABA) in Ireland and Norway respectively on the 30 October 2014. One of the primary objectives of the two events was to promote trade relations between African countries and the host countries. The AIEF was officially opened by the Minister of State for Development, Trade Promotion and North South Co-operation Mr. Seán Sherlock, TD while the keynote address at the NABA was delivered by the Norwegian Minister of Foreign Affairs Mr. Børge Brende. During their speeches, both Ministers acknowledged the positive relations and growing trade links between their countries and Africa. Most importantly, they challenged the participants to change their perceptions about Africa and to take advantage of available opportunities in the continent for their benefit and for the benefit of Africa. At the invitation of H.E. Hifikepunye Pohamba, President of the Republic of Namibia and the Chairperson of the SADC Organ on Politics, Defence and Security Cooperation, the leaders of the Coalition Government of the Kingdom of Lesotho paid a Working Visit to Windhoek, Namibia from 30th-31st July 2014. The delegation of the Coalition Government comprised The Right Honourable The Prime Minister Dr. Motsoahae Thomas Thabane, leader of the All Basotho Congress (ABC); Hon. 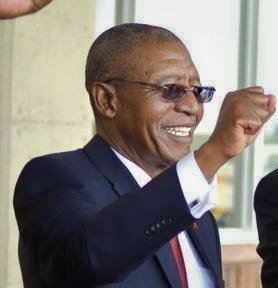 Mothetjoa Metsing, the Deputy Prime Minister, leader of Lesotho Congress for Democracy (LCD); and Hon. Joang Molapo, Minister of Home Affairs, representing the leader of the Basotho National Party (BNP). The Honourable Mohlabi Kenneth Tsekoa, Minister of Foreign Affairs and International Relations of the Kingdom of Lesotho, was part of the delegation. H.E. President Pohamba was accompanied by the Honourable Netumbo Nandi-Ndaitwah, Minister of Foreign Affairs. H.E. Dr. Stergomena Lawrence Tax, the Executive Secretary of SADC was also in attendance. The working visit was a follow-up to the discussions that H.E. President Pohamba held with the three Lesotho Coalition Government partners in Maseru, the Kingdom of Lesotho, from 12-13 June 2014. The consultations were held in a cordial and constructive atmosphere. The Coalition Government partners informed President Pohamba that since their last meeting in Maseru, considerable progress has been made towards ensuring the smooth functioning of the Coalition Government, which is the first experience in the history of the Kingdom of Lesotho. The Coalition Government partners reaffirmed their commitment to move expeditiously to address the outstanding issues, with the aim to enable the coalition government to serve the best interest of the people of the Kingdom of Lesotho. President Pohamba expressed his deep appreciation, on behalf of the Southern African Development Community (SADC), to the Coalition Government partners for the leadership they have provided despite the current challenges. President Pohamba encouraged the Coalition Government partners to continue to work together in good faith, unity and harmony. The Coalition Government partners expressed their gratitude to H.E. President Pohamba for the sterling leadership he has provided as Chairperson of the SADC Organ on Politics, Defence and Security Cooperation, and in particular for assisting the parties in the Coalition Government towards a finding lasting solution to the challenges facing the Coalition Government. The Right Honourable The Prime Minister, Dr. Motsoahae Thomas Thabane, expressed appreciation, on behalf of the Coalition partners, to H.E. President Pohamba, the Government and people of the Republic of Namibia for the warm hospitality extended to his delegation during their visit. Energy Business Review Reports that the Lesotho and South Africa agreement on the next phase of the Water Tranfer and Hydropower Generation project. Read more.